The tightly packed trees with emerald sheaves line the foreground and in the backdrop the crown of Kilimanjaro’s stone ashen mountains with snow topped peaks make their presence known. The journey between transports you to the golden dunes of the desert and up the soft beds of the ice fields before reaching the summit. The scenic views of the landscapes are astounding. 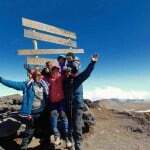 The 8 days Marangu Route is favoured by many due to the obvious nature of the path and its gradual incline increase. Are you willing to sacrifice the comfort of sleeping in a bed? Don’t fret, the Marangu Route is the only route that offers accommodation. The sleeping huts resemble dormitories and each bunk bed is equipped with a sponge mattress and pillow. Bathrooms and running water are available at the lower huts. Kibo uses a basic latrine system and buckets of water are available. 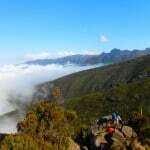 The 8 days Marangu Route is highly recommended by experts due to the extra acclimatisation day. All hikers eat their breakfast and evening meals in a dining hut and this creates an enjoyable, social atmosphere. A driver will pick you up from the airport. Orientation for the 8 days Marangu Route will take place at the hotel – your guides will share details and tips regarding the trek. They will check your gear and make adjustments if necessary. In the morning we will proceed to the Marangu Gate, the duration of the drive is approximately one hour. There will be a chance for you to acquaint yourself with the chefs, guides and porters in Moshi. 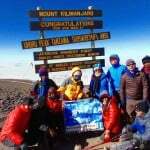 After registration at the gate we will embark on our 8 days Marangu Route to the summit of Mount Kilimanjaro. The trek begins in Kilimanjaro’s rainforest – it is referred to as the mountain’s timbered skirting and the emerald folds are hemmed by silver streams and shimmer with floral sequins. We will stop at the halfway point, Kisambioni, where an appetising picnic lunch will be served. The trail in the rainforest continues until the site of the Mandara Hut. There is an option of relaxing for the rest of the day or sauntering to the Maundi Crater once we arrive at the camp. You will not regret logging a few extra miles once you catch the first glimpse of the spectacular view of the Taveta in the east. 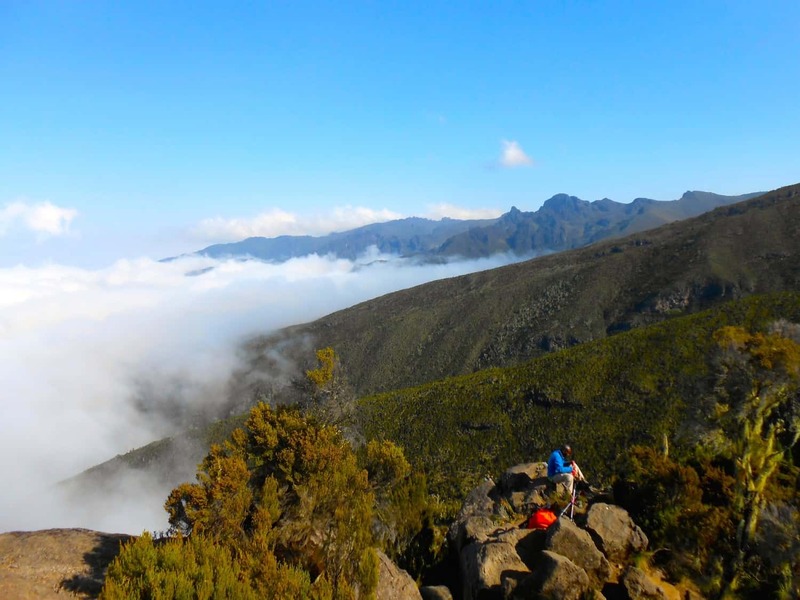 On a clear day, facing the north western region will reveal the wonderful view of the jagged edges of the Mawenzi Peak. Dinner will be served at the dining area. After breakfast we will begin our trek to the Horombo hut. 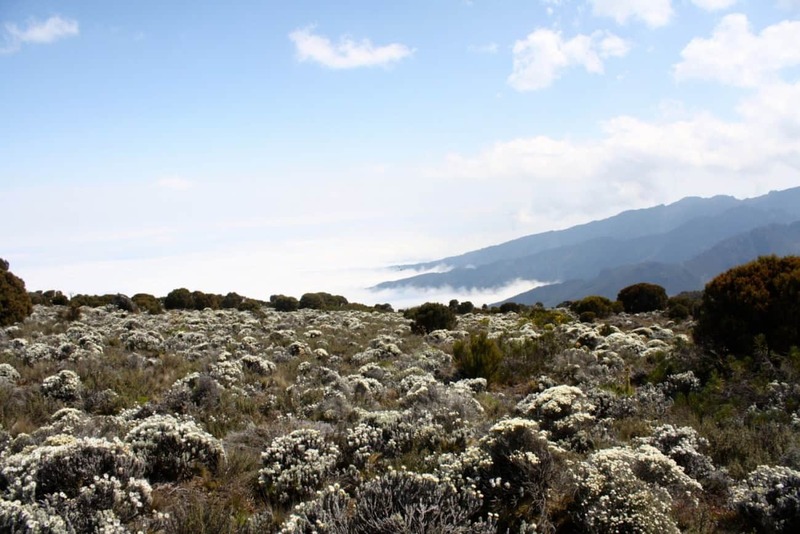 Today’s terrain, the Killimanjaro’s moorland, is a total contrast to the rainforest. Desert-like plants are scattered across the rocky landscape and in the distance the presence of Uhuru Peak and Mawenzi is acknowledged. When we get to Kambi ya Taanu we will take a break and enjoy a picnic lunch. Pleasant blue skies will allow you to marvel at the scenic views of Mawenzi and the peaks of Kibo. We will arrive at the Horombo Hut in the afternoon and you will have the opportunity to unwind for the rest of the day. The Horombo Huts are the ‘luxury’ huts on Kilimanjaro. The classic huts can accommodate up to eight people and they are used by ascending and descending hikers. Up to one hundred and twenty people can stay at Horombo and there is more space for cooks, guides and porters than at the other huts. The purpose of day three is to acclimate yourself to increase your chances of reaching the Uhuru Peak. 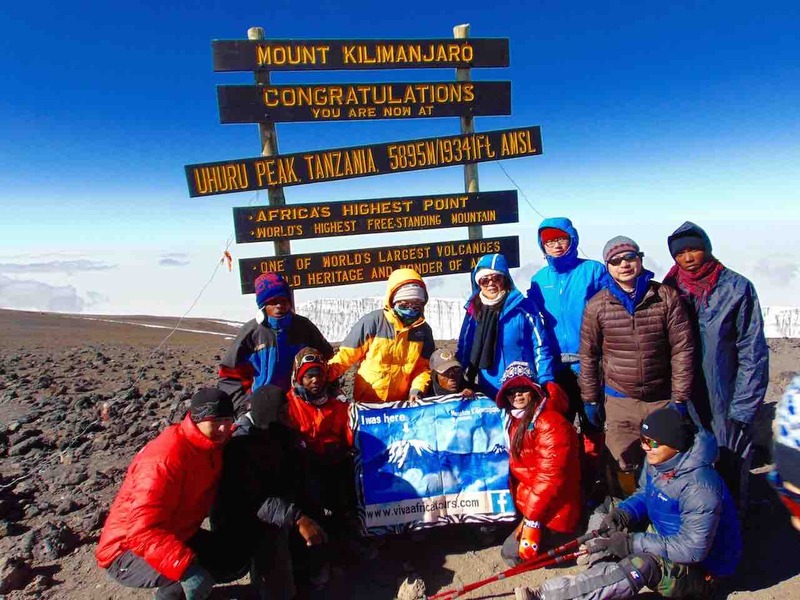 We suggest that you aim to hike all the way to Mawenzi Hut to enable maximum acclimatisation. The other advantageous reward of taking the hike is that the view of Kibo is spectacular from this angle. A delectable lunch will be served and lounge at the huts for the rest of the day. An energy dense breakfast will be served in the dining area and then we will embark on the final part of our 8 days Marangu Route. 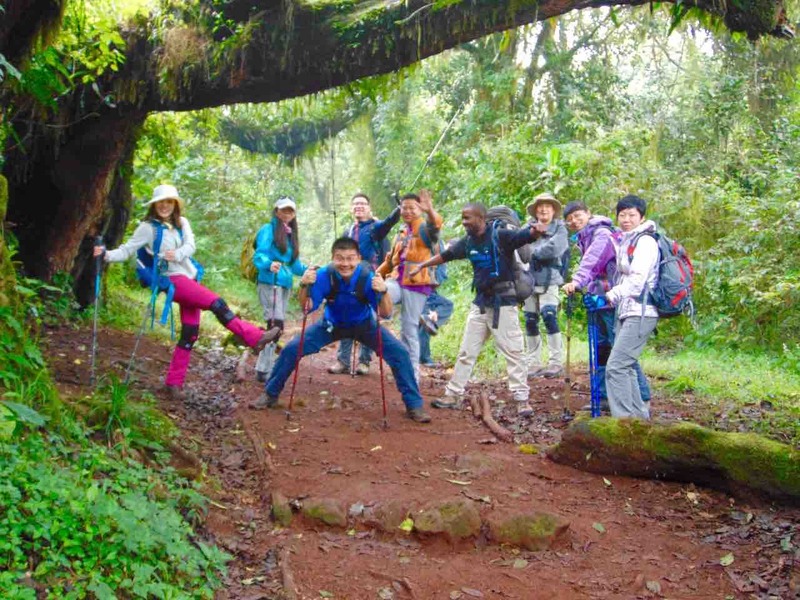 We will hike through the alpine desert of the upper altitudes of Kilimanjaro. After an hour we will arrive at the Maua River and encounter our first milestone, a small mountain stream. As you continue walking you will notice that the terrain gradually flattens and the vegetation starts vanishing. Once we come across the Middle Red Hill, we will take a break and eat lunch. The incline of Kilimanjaro’s Saddle is steady and we will hike along the trail for approximately two hours. 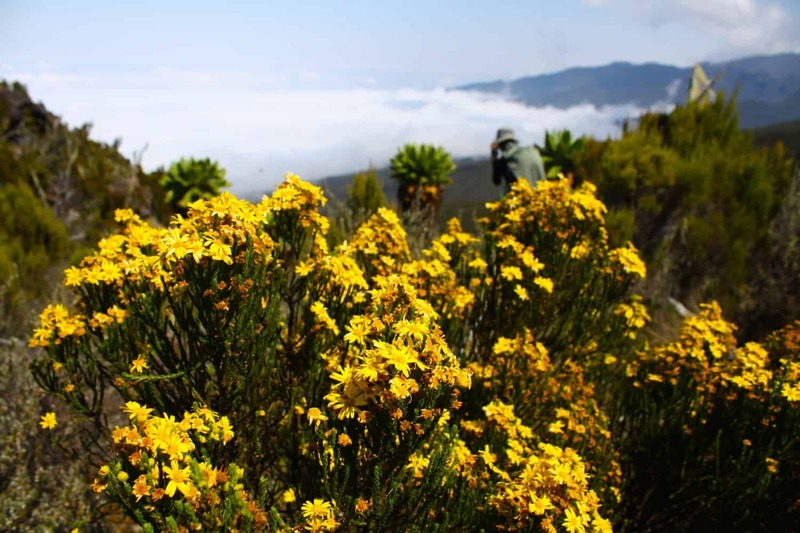 Although the environment on the way to Kibo is a desolate dessert and vegetation is scarcely placed across the land – the splendid views of Kibo and Mawenzi enhance the scenic pleasure and add colour to the golden surroundings. We will reach the Kibo Huts in the afternoon. It is recommended that you prepare for your midnight climb and attempt to rest as early as possible. We will begin the final ascent to Uhuru Peak, Africa’s rooftop. You will set off into the darkness of the midnight skies with a curious mix of minor fatigue and raw adrenalin that will carry you to the summit. The hike beings with a gruelling five hour trek to Gillman’s Point, located on the perimeter of the crater. 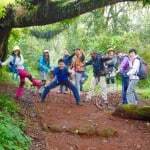 This trail is tremendously difficult irrespective of the fact that it is considered the easiest ascent path. It takes approximately two hours to come across the first major rest stop, William’s point. It is positioned at 500 metres and you will continue for another thirty minutes before encountering the rocky terrain that leads the way to Gillman’s Point (5,681 metres). The actual hike to Gilman’s does not have a great level of difficulty but when you combine the hike with a high altitude, it becomes tiring and long. 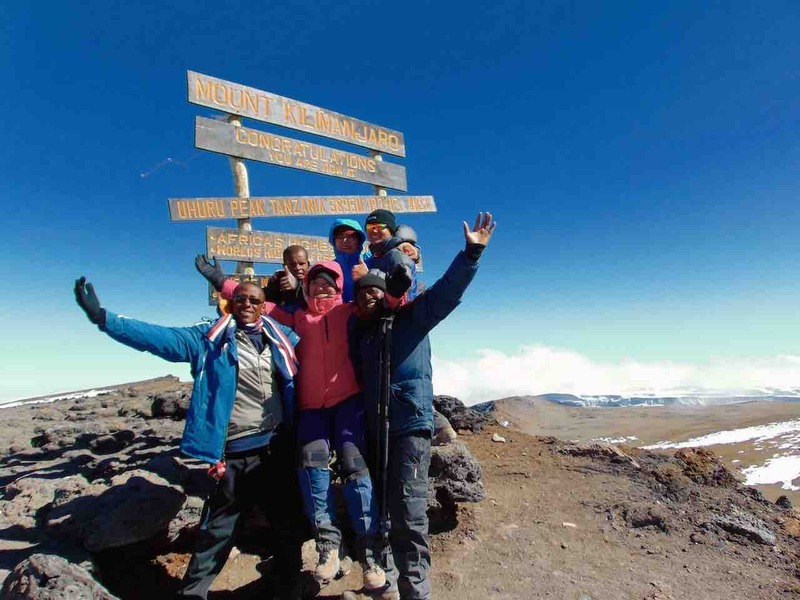 You will hike for a further two hours before reaching your goal, Uhuru Peak. Before our descent begins, you can take photos of the magnificent landscape and your group. You will realize that the route down the summit has remarkable views that were out of sight whilst ascending. We will stop at the Kibo Hut to give you a chance to catch your breath. In the afternoon we will arrive at the Horombo Huts. You can relax and savour your last night on the mountain. After enjoying your last breakfast in the dining area, you will start your last trek. 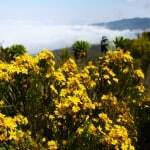 The descent to the Marangu gate includes one of the most beautiful sights, Kilimanjaro’s cloud forest. Marvel at the rays of light and mysterious puffs of white that gleam through the underpass of branches. Please remain alert when you are walking as the path tends to get slippery. Our vehicles with take you back to Moshi when you arrive at the Marangu Gate. You will have the opportunity to purchase sodas and souvenirs that will remind you of your 8 days Marangu route for years to come. A driver will transfer you to Kilimanjaro Airport, from where you will connect your flight. If you’ve decided to go on a safari – well, that’s a different adventure and we’ll be thrilled to arrange it for you as well!